Decorative cardinals on the Whitehall Cardinal Large Tube Bird Feeder call your feathered friends in to your backyard sanctuary to feed. Raised flowers, branches, and cardinals decorate the 9.5" square roof as it protects the seed from the elements. 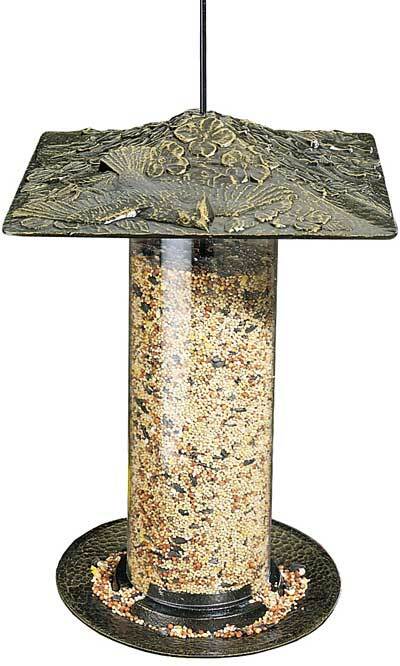 A hammered finish on the roof and tray add to the handcrafted beauty of this feeder. Three seed ports spill onto the 8" round feeder tray where there is plenty of room for birds to comfortably feed. The clear feeder tube holds 2.25 quarts of seed and keeps the seed level visible at all times. Simply slide the roof up the included black, powder coated hanger for easy cleaning and filling. The recycled aluminum roof and tray are weather resistant and will provide enjoyment for many years. Celebrate birds in your yard with this Cardinal Large Tube Bird Feeder. Made in the USA.